Bruce Bartlett is a historian and former Reagan adviser who describes himself as a lifelong conservative that believes the current GOP panders to fools. He’s written for the Economix blog at the New York Times and has authored several books including The Benefit and the Burden: Tax Reform – Why We Need It and What It Will Take. I’m a longtime fan of Bruce’s work and when he contacted me about a post, I asked him if I could pick his brain about economics and economic myths. Bruce Bartlett in a 2012 interview with Bill Moyers. 1. What myths do you hear the most about the economy, Bruce? Probably that government spending is per se bad for the economy and that cutting spending is per se stimulative. Republicans believe that government is a giant leech that only takes from the private sector and gives nothing back, so spending necessarily diminishes the resources available for individuals, families and businesses to spend themselves. This is nonsense because we desperately need basic infrastructure improvements and repairs, what economists call “public goods,” and because spending in the economy is inadequate to raise the growth rate—people are not consuming or making investments in housing and businesses are sitting on hundreds of billions of liquid assets that are neither invested nor distributed to shareholders to spend. When this happens, the economy grinds to a halt. Virtually zero inflation and interest rates, falling commodity prices, and a low employment-to-population ratio are all evidence of this. 2. In your opinion, which is the most damaging? The lack of infrastructure. Look at Flint, Michigan, where Republicans are literally poisoning people because they refuse to spend money on public works. We should also be spending like crazy to cope with the inevitable consequences of global warming and rising sea levels. We need to be building sea walls in vulnerable areas and other things that we will regret not having built when the money to do so was almost literally free because of low prices and interest rates. 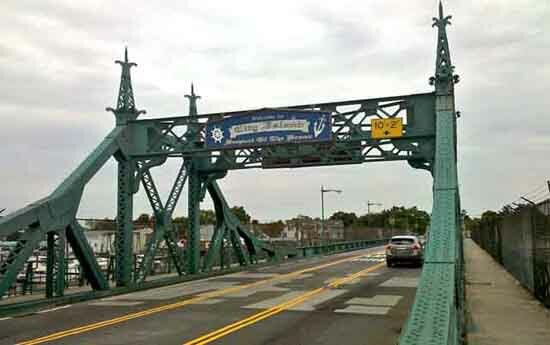 City Island Bridge, which connects The Bronx and City Island, in New York City is scheduled to be rebuilt by 2017 (Mike from NY/CC-BY-SA 2.0). 3. Have you found any particularly powerful ways of countering economic myths? If so, what? No. Only reality will change the way people think. That means paying a much heavier price in the future to fix things that could be fixed very cheaply now. 4. In your opinion, how would you describe how an economy should work? What role does government play, for example? Government is part of the economy and society, not some alien force that is separate and distinct. It has its role to play in ways that go beyond what libertarians are willing to concede in terms of police, courts, and a minimal military. In particular, I think government has a much bigger role to play in terms of redistribution and provision of a safety net in areas such as health that even Democrats are afraid to acknowledge, because they fear being charged with class warfare and because they are dependent on campaign contributions from the ultra-wealthy. 5. Why do people struggle when it comes to understanding the economy? Where do they struggle the most? The hardest thing to understand is the government’s macroeconomic role, the idea that spending and deficits are at times absolutely essential to get the economy moving. Also, no one understands monetary policy. Conservatives always see hyperinflation right around the corner and keep pressuring the Fed to tighten no matter what the reality is and what the data show. Deflation, not inflation, is our big problem. 6. What do you think is the biggest economic mistake the Obama administration has made? Obama pivoted away from the economy as soon as the stimulus bill passed in 2009, and turned his attention to health, energy, and other issues. His supporters argue that nothing further could be done in terms of stimulus because Congress wouldn’t support it. Maybe so, but I think the terms of debate could have been changed with strong presidential leadership. I don’t think Obama has ever understood how to properly use the bully pulpit as Ronald Reagan did. He always sounds like he’s giving a college lecture when he speaks—that seldom arouses passions or encourages people to act. 7. What’s the smartest economic decision the Obama administration has made? Certainly Obamacare is good policy, but I wouldn’t really call it economic policy although it obviously has economic consequences. Beyond that I regret that I can’t really think of any particularly good actions by this administration beyond the absolutely minimal stimulus enacted in early 2009. All I can think of are lost opportunities. We have been treading water, economically, for more than seven years. 8. What economic advice would you give the next administration (regardless of party)? Stop thinking that tax cuts are the only policy that can be used to stimulate growth or deal with any other economic problem. It really doesn’t work anymore. 9. How do we defeat politicians writing laws in favor of the wealthiest in exchange for political donations? The problem may be taking care of itself as the ultra-wealthy realize that money can’t buy elections, at least at the presidential level. Virtually all the money raised by Jeb Bush was wasted; when he spent money in some state and ran a lot of ads, his support dropped. This is true of Hillary Clinton as well to some extent. Donald Trump and Bernie Sanders are winning without big contributions and to a large extent because of it. I think one of the secrets to Trump’s success is that he isn’t forced to waste time on fundraising and can spend that time doing media and other things that get votes, while his opponents must waste vast amounts of valuable time dialing and schmoozing for dollars. And Sanders has shown that one can run a viable campaign with small contributions. 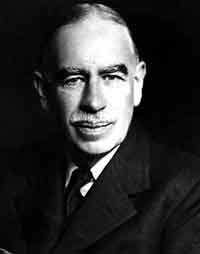 Economist John Maynard Keynes (Akiba101/CC-BY-SA 3.0). 10. Why don’t more economists write about public policy? Or do they and we just don’t hear about it? They do quite a lot, but quite often it takes the form of interviews that are filtered through a journalistic lens or op-ed articles that presuppose that the reader is familiar with the underlying academic research upon which it is based. I was only able to finally figure out John Maynard Keynes when I stopped reading his academic work and concentrated on reading the interviews, testimony, memos, and articles written for policymakers and a general audience. All of our greatest economists, such as Milton Friedman and Paul Krugman, have been gifted in their ability to communicate to academics, policymakers, and the general public. 11. Who would you choose for chief of the Council of Economic Advisors? Sadly, the CEA is an institution declining in influence so it probably doesn’t matter in terms of policy. But I would hope that if Sanders wins he would appoint my friend Jamie Galbraith as his principal economic adviser. I assume Clinton will fall back on the same people who advised her husband and in many cases Obama—Larry Summers, Gene Sperling et al. I just hope if a Republican wins, he won’t appoint crazy people who have no idea what they are talking about to any key positions, people like Steve Moore and Larry Kudlow who advocate big tax cuts for the rich for every problem and just assume growth will follow. 12. What one question am I not asking that I should be asking—and your answer? I think public policy has been hurt by an overemphasis on economics. We need to be listening to other disciplines, such as sociology and psychology, to find answers to the problems we are dealing with today. Economists know the answers, they just have no idea how to get from here to there—as in the old joke, they tend to just assume a can opener. Sociologists and psychologists, political scientists, and others can help us figure out how to get things done before we succumb to fascism. As we know, nature abhors a vacuum, but it also abhors gridlock. Sooner or later, people will demand action to get things done and democracy will suffer. 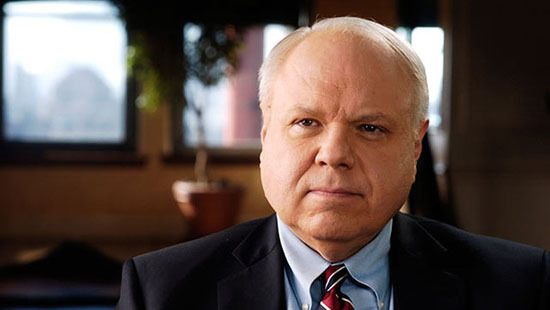 Bruce Bartlett held senior policy roles in the Reagan and George H.W. Bush administrations and served on the staffs of Reps. Jack Kemp and Ron Paul. 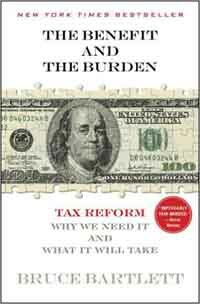 He is the author of The Benefit and the Burden: Tax Reform — Why We Need It and What It Will Take.